Since June 4, Downtown Denver is looking and tasting a little different. Just shy of three months old, the Union Station Farmers Market is leaving an impression on Denver’s locavores. As a new addition to the Boulder County Farmers Markets, a 501c4 nonprofit behind a string of successful Colorado farmers markets such as the award-winning Boulder Farmers Market, Union Station Farmers Market is finding its place in the heart of the city. The market is a meeting place for Denverites, chefs, and farmers to connect and engage with local food. The weekly chef demo, made possible by EAT Denver, is already a popular market program. Each Saturday, a selected chef shops the market, prepares a locally sourced dish, and educates the community on the seasonal ingredients and delicious flavors. Katie Lazor, marketing manager, believes that Union Station Farmers Market will continue to connect the community with farmers while developing into an educational resource. Union Station Farmers Market hopes to increase accessibility to fresh food by working alongside various organizations promoting local agriculture. Welcome USFM to the scene and be sure to check out their Guest Instagram posts to learn more about this young, buzz-worthy market! Farmers Market Coalition: Tell us about your market. Katie Lazor: The Union Station Farmers Market, a growers-only market organized by the 30-year-old Boulder County Farmers Markets nonprofit organization, launched on June 4, 2016 for its first season in downtown Denver at the newly remodeled Union Station. The outdoor market, located on the Wynkoop Plaza north of the main entrance on Wynkoop Street, will be home to 37 local food and drink vendors every Saturday from 9 a.m. to 2 p.m. The growers-only market will consist of 60 percent farmers, who will sell only what they have grown and raised on their own farms in Colorado. This market is supported by a USDA Farmers Market Promotion Program grant. FMC: What can one expect when coming to the Union Station Farmers Market? KL: The Union Station Farmers Market strives to encourage all community members to engage with farmers and local agriculture. The market accepts SNAP and WIC, and hosts nonprofit educational groups within the market. We run a weekly Chef Demo program and the market hosts live and local music each Saturday, as well as planned events throughout the seasons. KL: The Union Station Farmers Market utilizes Facebook, Twitter, Instagram and a weekly newsletter regularly, as well as paid advertising opportunities with local public transportation, radio and magazine in its first two years to generate awareness of the new market. The market works with local government agencies, nonprofit organizations and agriculture-related businesses to promote through flyers and digital communications. FMC: What is unique about your market? 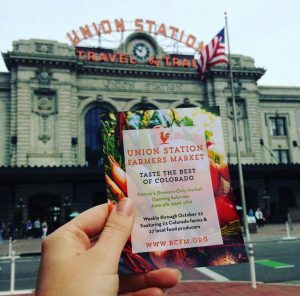 KL: We love that the Denver chef community invited our nonprofit organization to open a market at Union Station, and that the greater community is craving a growers-only market, where they can truly connect with their farmers and learn more about local agriculture. One of the most special things about this market is that it is truly a unique collaboration, a market that wouldn’t be possible without support from Union Station, Downtown Denver Partnership, Regional Transportation District, City of Denver and the Denver chef community. FMC: What are some of your market’s successes and challenges? KL: The main challenges of opening the brand new market at Union Station are access to vendor and customer parking in an urban setting and generating community awareness about the new market.